Click Here for full text of the paper, available in Adobe .PDF Format. Technical Details on Downloading and Viewing: You must have the freeware Adobe Acrobat reader or web plugin (for Netscape) in order to view this file. If you do not already have an Adobe Acrobat reader, you can obtain a free copy (for all major desktop operating systems) at Adobe's WWW site. Full Text of the paper, available in Adobe .PDF Format. The ownership of plants and animals, and hence national and household food security, will be affected by decisions on a sub-paragraph in a World Trade Organisation (WTO) agreement currently due for review. 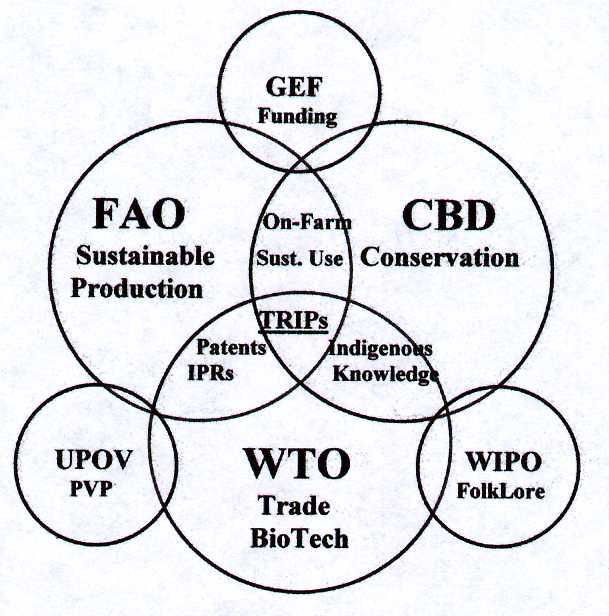 The review is taking place at a time when attempts by developed country institutions and companies to patent biological materials taken from developing countries are being vigorously contested as is the development and release of genetically modified seeds and breeds (living modified organisms), whose commercial viability, it is asserted, depend on the existence of global intellectual property protection systems for biological materials. In 1999, Members of the WTO must review Article 27.3(b) of the Agreement on Trade Related Aspects of Intellectual Property Rights - the TRIPs agreement. This sub-paragraph, in the Agreement's section on Patents, describes the WTO rules about the ownership of plants, animals and biological processes. These rules currently allow Members not to have to patent regimes for plants, animals, other than micro-organisms, and biological processes for producing plants or animals. It does, however, require countries to provide some form of intellectual property protection for plant varieties. The decisions taken on the wording of this sub-paragraph will determine the minimum standards that countries must impose for the protection of intellectual property on plants, animals and biological processes, whether they originate in the country or are imported. It will influence access and benefit sharing agreements with respect to genetic resources. The outcome of the review will set precedents for future trade and environment negotiations and will in particular constrain the development of biodiversity-friendly legislation as required by the Convention on Biological Diversity (CBD). The paper describes and interprets the Article. It gives some negotiating options and suggests priority activities and possible courses of action. It highlights urgent capacity building priorities, including the development of country-specific legislation, improvement of access to information and the development of coordinated positions on the negotiations, both nationally and internationally. This is an urgent agenda, which, if not tackled promptly and effectively, will ultimately increase the legislative burden on, and reduce the benefits to, Commonwealth developing countries, which have much to contribute because the sovereign rights they have over the biological resources that industrial countries need. This gives them a potentially strong negotiating position. Commonwealth developing countries must rapidly organise internally and within regional blocs to ensure that they have choice over the immediate outcome, for example, negotiating a delay in the process. This would allow time to assess fully and comprehensively the likely impacts of these measures and to develop sui generis legislation, recognised by trading partners, for the protection of their plants, animals and biological processes, especially their food production systems. In 1999, Members of the WTO must review Article 27.3(b) of the Agreement on Trade Related Aspects of Intellectual Property Rights - the TRIPs agreement. This sub-paragraph, in the Agreement's section on Patents, describes the WTO rules about the ownership of plants, animals and biological processes. These rules currently allow Members not to have to patent regimes for plants, animals, other than micro-organisms, and biological processes for producing plants or animals. It does, however, require countries to provide some form of intellectual property protection for plant varieties. While everyone is aware that the review must be held in 1999, no date for the start of the review will be fixed until a country formally requests it. This may be discussed at the meeting of the Council for TRIPs on 1st and 2nd December 1998. Commonwealth developing countries need to consider a range of issues, options and capacity building requirements in preparation for this review. The review is part of a wider process that will determine what choices countries will have over their access to, the sustainable use of, trade in, and benefits arising from the use of plants, animals and biological processes. The results will affect a nation's capacity to provide food and livelihood security for its citizens. It is not a trivial process. The decisions taken on the wording of this sub-paragraph will determine the minimum standards that countries must impose for the protection of intellectual property on plants, animals and biological processes, whether they originate in the country or are imported. It will influence access and benefit sharing agreements with respect to genetic resources. Despite this review, most developing countries should have enacted legislation for the protection of plant varieties (developing or changing seed laws in line with this sub-paragraph) by 1 January 2000 - 1 January 2005 for least developed countries. Introducing legislation at a time when this sub-paragraph and the whole TRIPs agreement are to be reviewed, is causing added difficulties in many countries. negotiations in the Food and Agriculture Organisation of the United Nations (FAO) on the revision of the International Undertaking on Plant Genetic Resources [for food and agriculture] (IU) and its submission to the CBD as a possible Protocol. A complicating factor is that each of these negotiations is usually handled by different ministries and departments (e.g. WTO -Trade; Intellectual property - Patent Office; CBD -Environment; FAO - Agriculture), which can lead to a loss of policy coherence and weaken a country's position. Discussions are essential between all relevant ministries in order to agree mutually acceptable negotiating positions for this review and related processes, so countries are able to understand the linkages between, and implications of, all the international negotiations. Good communication with Geneva-based negotiators is also essential to ensure clear communication of positions taken by the competent authorities in capitals. In addition, countries may wish to make effective links among regional blocs to improve their negotiating strength, in advance of the review of TRIPs Article 27.3(b). Doing nothing, simply reviewing progress in implementing the sub-paragraph and leaving the wording as it is, retaining some ambiguity. This would provide countries with maximum flexibility within the existing agreement, particularly because the exact meaning of most of the terms has yet to be agreed, or defined by international jurisprudence. By agreeing to do nothing it also reduces the risk of negative changes being imposed. Extending the exclusions to patentability to include all living organisms and the associated knowledge for their conservation and sustainable use. This is the option favoured by many developing countries whose genetic wealth and the food and livelihood security of their citizens could be threatened by monopoly ownership of biological resources through patents. It is a low-cost option removing the need to defend their resources and know how through litigation. Benefit sharing arrangements should be agreed through the FAO/CBD negotiations in the International Undertaking and the CBD itself, which may prove a better arrangement for developing countries. Removing the obligation to provide plant variety protection or ensuring that measures adopted are carefully tailored to a country's own needs - the sui generis option. Most developing countries do not require this as a priority. The reciprocal arrangements with developed countries for the use of their protected plant varieties or germplasm, which have been produced mainly to meet the needs of northern temperate industrial agriculture, are not usually to the advantage of the majority of farmers in developing countries. With the exception of a few industrial export-oriented commodities, such as flowers, the priority for the majority of people is for the local development of varieties adapted to the needs of sustainable agricultural practices in labour intensive holdings. Deletion of the whole sub-paragraph, which would provide for no exclusions to patenting of living organisms and their accompanying intellectual property - an option favoured by some industrial countries. This would favour the biotechnology industry, which would be able to insist that all countries impose and recognise their patents, and their right to patent material irrespective of its origin. to provide essential evidence of perceptions and possible impacts. options for developing so-called sui generis legislation, suited to a country's own specific needs, as permitted under existing WTO rules. Regionally, within country-blocs, a comparison between the needs, specific circumstances and obligations of different countries would help to identify stronger negotiating positions in this review as well as in the related negotiations. Seeking to delay the review and the legislative timetable until after the full TRIPs review has been completed. Opening the review, as required, but then completing it in parallel with the full TRIPs review and the renegotiation of the Agreement on Agriculture over subsequent years. 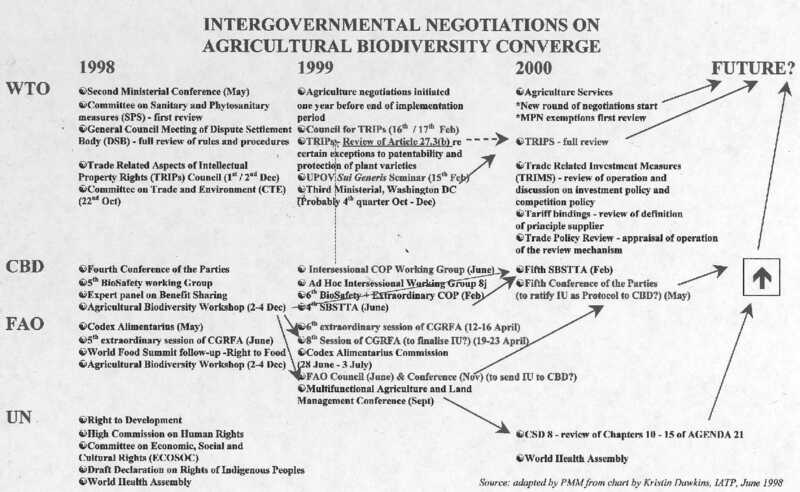 Raising, a set of questions concerning the possible conflict between some Members' obligations under the Convention on Biological Diversity and their obligations under TRIPs, that need investigating before the review can be concluded, in one of the WTO's Committee on Trade and Environment (CTE) four-monthly meetings (next meeting on October 22nd 1998 may consider intellectual property issues including the TRIPs review). Requiring satisfactory completion of the negotiation of the revision of the IU and its adoption as a Protocol to the CBD, before completion of the review. Alternatively, a rapid completion of the review, possibly by agreeing that no changes to the text are required. Most of the wording in Article 27.3(b) of the TRIPs agreement is deliberately ambiguous and open to interpretation. Until there is a sufficient body of international jurisprudence, countries cannot know definitively whether or not their response to the sub-paragraph will be deemed legal. Other pressures from trading partners, donors and other international agreements may also be brought to bear on countries, obliging them to comply with this agreement and a specific interpretation of this sub-paragraph. For example, to comply with the requirement for plant variety protection, pressure may be applied to persuade a country to join the International Convention for the Protection of New Varieties of Plants (UPOV). This Convention is considered by some to be the only effective form of sui generis legislation, despite there being no specific mention of UPOV in the WTO text and there being other options better suited to a country's own needs that could be developed. Legal clarity will eventually be achieved only through the WTO's Dispute Settlement Body, which arbitrates in the event of a disagreement between Members. However, these disputes may also need to be tested against the dispute settlement procedures of other relevant conventions, such as the CBD. This could prove a lengthy and costly process in which developing countries may be disadvantaged. It could be avoided by removing the obligation for countries to have intellectual property protection on any plants, animals or biological processes, under the rules of the WTO and leave developing legal protection, as necessary under the CBD. Regionally, within country blocs including in the run-up to the Commonwealth Heads of Government Meeting (CHOGM) in November 1999, a comparison between the needs, specific circumstances and obligations of different countries would help to identify stronger negotiating positions in this review as well as in the related negotiations. Most Commonwealth developing countries have the competence to develop clear negotiating positions. The key constraint is lack of access to national and international information. Internet access to international information is necessary to ensure equal knowledge at the negotiating table, but the most pressing task is to gather information nationally and especially within local communities to assess how best to protect a country's plants, animals and associated knowledge systems, perhaps through some form of community rights regime. Work needs to start immediately to develop strong national positions for the revision of TRIPs Article 27.3(b) and, if agreed, the preparation of necessary sui generis legislation. Regional negotiating positions are also needed and these could be strengthened through resolutions made by the Commonwealth Heads of Government Meeting (CHOGM) in 1999. In order to develop this programme of work, increased capacity and, in some cases, reordering of curr ent priorities, will be required. Developing alternative sui generis systems, especially in compliance with TRIPs Article 27.3(b), and improving understanding of the interpretation of specific terms and aspects of relevant agreements and developing negotiating positions for the upcoming Review. Improving availability of information technology and access to electronic information through the Internet, for all those who are involved in developing positions in these negotiations and in developing relevant legislation, policies and programmes. Improving understanding, awareness, co-ordination and synergies on these issues within and between different national institutions, professional bodies, local communities as well as the wider public. Strengthening regional approaches to these negotiations and improving regional coordination. Improving working relationships with international bodies that can provide technical assistance. Enhancing networks and campaigns relevant to these issues. This is an urgent agenda, which, if not tackled promptly and effectively, will ultimately increase the legislative burden on, and reduce the benefits to, Commonwealth developing countries. These countries have much to contribute because the sovereign rights they have over the biological resources that industrial countries need gives them a potentially strong negotiating position. Commonwealth developing countries must rapidly organise internally and within regional blocs to ensure that they have choice over the immediate outcome, for example, negotiating a delay in the process. This would allow time to assess fully and comprehensively the likely impacts of these measures and to develop sui generis legislation, recognised by trading partners, for the protection of their plants, animals and biological processes, especially their food production systems. the FAO International Undertaking on Plant Genetic Resources [for Food and Agriculture] (IU) agreed to by 111 countries. Each of these agreements and decisions, which are mutually supportive, may be better suited to providing long-term equitable sharing of the benefits from the use of biological resources for food and agriculture as their purpose is to safeguard these resources for future generations through, inter alia, facilitating their sustainable use. UK Agricultural Biodiversity Coalition (UKabc) HomePage Introduction to issues concerning sustainable use, conservation and protection of agricultural biodiversity. Links to many sites and documents. Most of the sites listed below can be accessed through this page. People, Plants and Patents: the impact of intellectual property rights. Report of the Crucible Group (1995). The Convention on Biological Diversity and the Agreement On Trade-Related Aspects of Intellectual Property Rights (TRIPS): relationships and synergies. 1996 paper to COP 3. Intellectual Property Rights and Plant Genetic Resources: Options for a Sui Generis System by Dan Leskien and Michael Flitner. IPGRI Issues in Genetic Resources No. 6 June 1997. Human Nature: Agricultural Biodiversity and farm-based food security by Hope Shand, RAFI. Institute for Agriculture and Trade Policy (IATP), USA. Signposts to Sui Generis Rights (GRAIN, BioThai) Resource material from an international seminar on sui generis rights (1-6 Dec 1997). The outcome of the Seminar was the Thammasat Declaration. WTO: Trade and Environment including 'Background to WTO work on trade and environment' 'The Marrakesh Ministerial Decision on Trade and Environment', 'The relationship between the provisions of the multilateral trading system and trade measures for environmental purposes, including those pursuant to multilateral environmental agreements'. Implement TRIPs in an "informed, democratic and specific manner". Briefing from TWN.